The Old Vic (originally The Royal Coburg Theatre). Designed by Rudolph Cabanal of Aachen, 1816-18. Opened 11 May 1818. Brick and other materials, some of which came from the old Savoy Palace which was pulled down to open the way to Waterloo Bridge. Waterloo Road, London SE1. Until 1833, the theatre was named in honour of Prince Leopold and Princess Charlotte, its original patrons. It opened with a programme including "a melodrama, an Asiatic ballet and a harlequinade" (Weinreb 602), and from 1845 had a 4d. gallery which would be filled with young costermongers and ther like, even including sweeps and dustmen, all taking rowdy part in the performances (see Mayhew 25). But it was also a venue for the more discriminating: "For over a century most of our great actors have appeared within these plain but dignified walls," wrote Arthur Mee in 1937 ( 654). 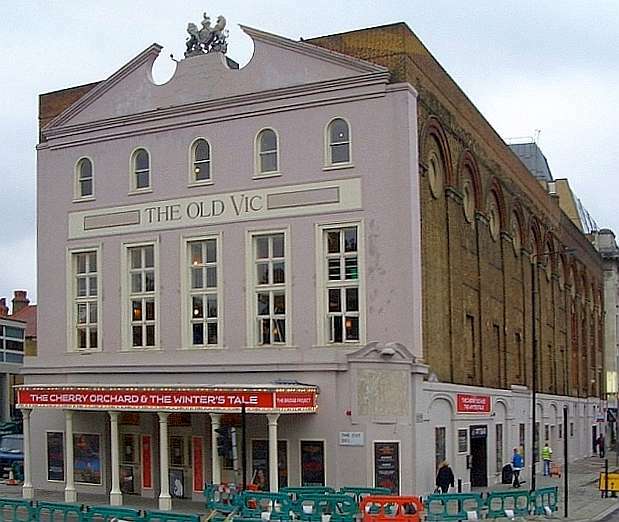 History of the Old Vic (the theatre's own website). Web. 11 May 2017. Mayhew, Henry. London Labour & the London Poor: A Selected Edition. Ed. Robert Douglas-Fairhurst. Oxford: Oxford University Press, 2010. Mee, Arthur. London: Heart of the Empire and Wonder of the World. London: Hodder & Stoughton, 1937. Weinreb, Ben, et al., eds. The London Encyclopaedia. 3rd ed. London: Macmillan, 2008.